Among the literally thousands of archaeological sites in the Negev one can find many Christian sites most of which are barely known. One of the most impressive sites must be that of Shivta. Shivta began as a Nabatean town that was just off the main Nabatean Perfume and Spice Route which ran from the Arabian peninsula across the vast expanses of desert to the then important sea port in what is today the town of Gaza. Shivta is an intriguing place with many still unsolved riddles. While there may be many riddles there are some very impressive facts not least of them being the ruins of the Church at the northern extremity of the site. This site although in ruins has some very impressive and beautiful remains as one can see in the pictures below. 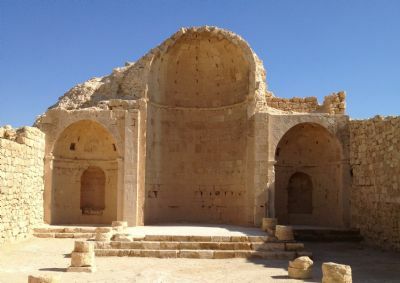 Shivta is an open site and there is no entrance fee and one may enter and tour freely during daylight hours. The site is easily accessed on paved roads by private car and or bus. On Friday afternoons and Saturdays we can put our jeeps to good use exploring the area around Shivta which was once a bustling farming community and is littered with archaeological remains some of which are very impressive. Not far from Shivta are the breathtaking ruins of Rucheibe (Rechovot be Negev). These ruins also date back to the Nabatean and Byzantine eras. The site is huge and barely excavated. Among the more interesting findings there is a church and adjoining monastery and several wells some of which are amazingly deep. From top left to bottom right: Part of the monastery attached to the Rucheibe Church, ancient script engraved on the door frame of the monastery, more script on a door frame, a view of the vast expanses of desert around Rucheibe, an ancient tether in what might have been stables outside the Church of Rucheibe, the Western well complete with what might have been a bath house.